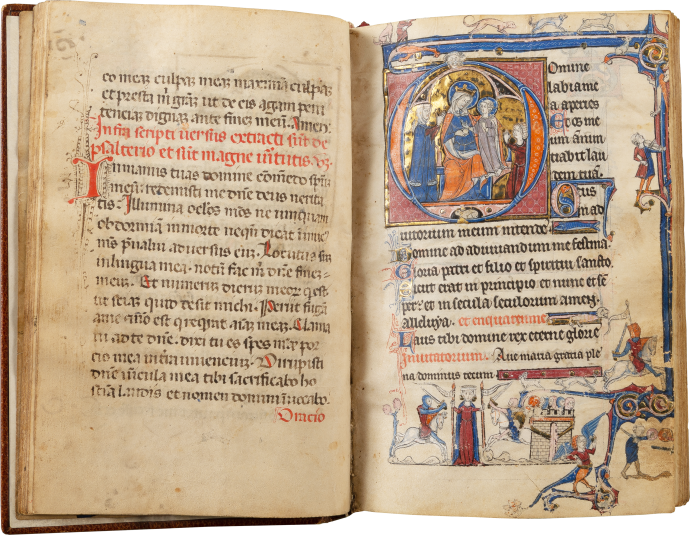 Extensively published, this is one of the oldest and most important of all early Books of Hours, and one of the few thirteenth-century books unambiguously made for a named laywoman, possibly Marie de Brabant (1256-1321), queen of France married to King Phillip III. Its pages virtually explode with a richness of imagery, in the painted initials and throughout the margins, illustrated with almost 300 images, an unusual number of which display women in daily life and are set in the royal court. 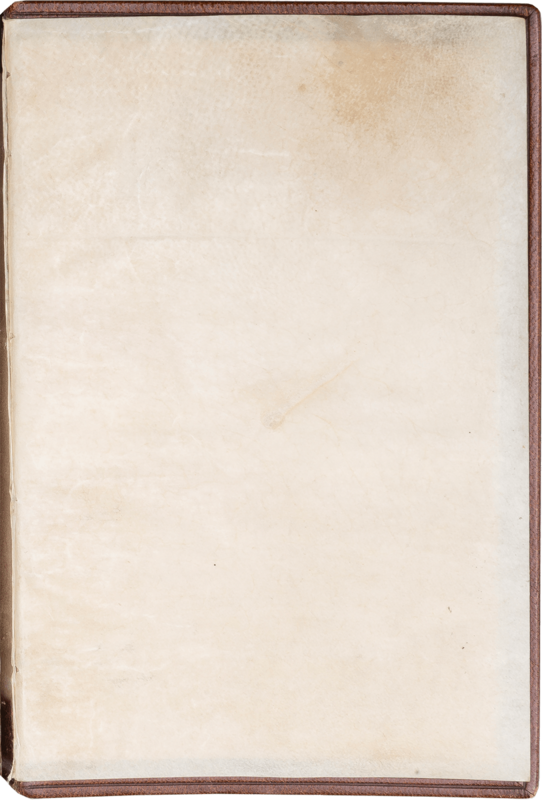 Parchment flyleaf + 209 folios on parchment (5 originally blank) + parchment flyleaf, lacking at least 6 leaves at beginning and 3 blanks elsewhere, else complete, first two surviving leaves bound in reverse order, modern pencil foliation (followed here) begins with '5' on the third leaf but repeats '159' and '187' and so reaches '' by the end, collation: i2 [doubtless of 8, lacking i-vi, vii-viii bound in reverse order], ii8, iii4 [iv originally blank], iv-xii8, xiii5 [of 6, blank vi cancelled], xiv-xx8, xxi4 [iii-iv originally blank], xxii-xxiv8, xxv6 [of 8, blank i-ii cancelled], xxvi-xxviii8, xxix4 [iii-iv blank], with one remaining catchword (folio 72v, end of quire x); ruled in plummet, justification 112 x 70 mm., single column, 18 lines, written in dark brown ink in two sizes of a gothic hand or littera textualis beginning below top line, rubrics in red; line-fillers throughout in burnished gold with colors and white tracery in myriads of designs including people, fish, dragons, birds, animals, monsters, grotesques, some naturalistic, many very comic; one-line versal initials throughout alternately blue with red penwork or burnished gold with dark blue penwork; firework bursts of diagonal penwork in the lower margins throughout in red and blue; 2-line illuminated initials throughout in elaborate leafy designs in colors and burnished gold often enclosing or including dragons and other creatures including human heads and with scrolling marginal extensions, often supporting birds and animals; marginal figures throughout including men and women in numerous poses, dancing, hunting, fighting, praying and clambering through the foliage and penwork sprays (see below); twenty-two historiated initials from 3 to 9 lines high in colors with white tracery and highly burnished gold grounds and usually long scrolling marginal extensions; once-wide margins cropped with some loss of extremities of figures or scenes in the upper and sometimes outer borders, some smudging and thumbing affecting the illumination, some staining and cockling especially towards the end, a picture or other piece once pasted on folio 153v now removed; nineteenth-century French blind-stamped binding by Gruel (signed in gilt at foot of spine), parchment endleaves, gilt edges, in a full black morocco fitted case. Dimensions 173 x 116 mm. 1. 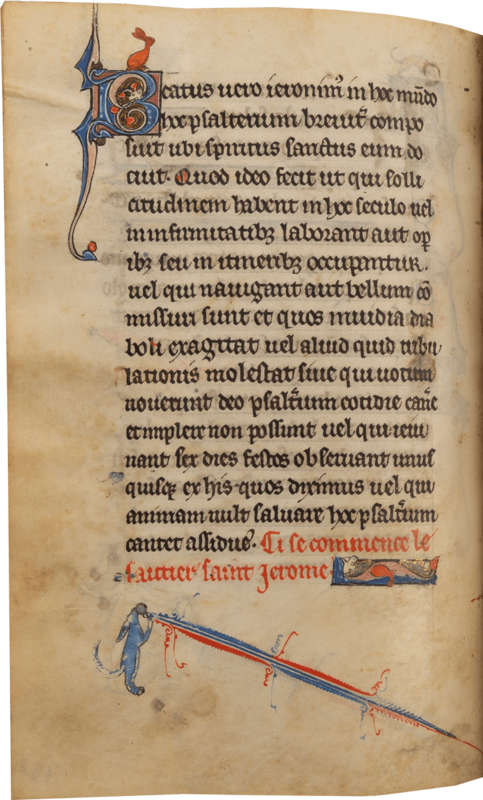 Written for female use for a woman called Marie, who is named in a prayer to God at the top of folio 198v, "famula tua maria" - "your servant Marie;" possibly Marie de Brabant (1256-1321), queen of France, who married Philip III on 21 August 1274 (see above). 2. 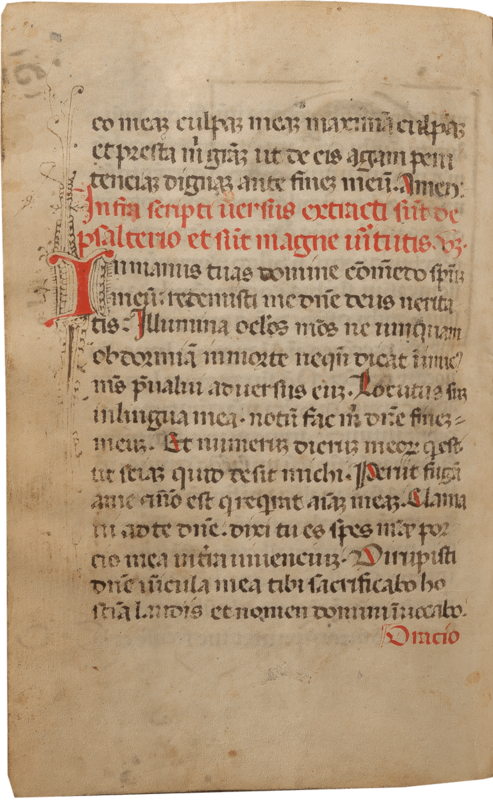 In Italy by the fifteenth century, when prayers were added on folios 15v-16v and 152r for a man named "Ludovico" or Louis ("indigno famulo tuo Lodovico," folio 16r). 3. It was rebound in Paris by Léon Gruel (1841-1923). 4. Louis-Alexandre Barbet (1850-1931); his sale, Drouot, Paris, 13 June 1932, lot 7. 5. Sold in 1987 by Sam Fogg, London, to the recent owner, who three years later placed it on long-term deposit at the Metropolitan Museum of Art, New York, where it remained until 2017 as MS L.1990.38. 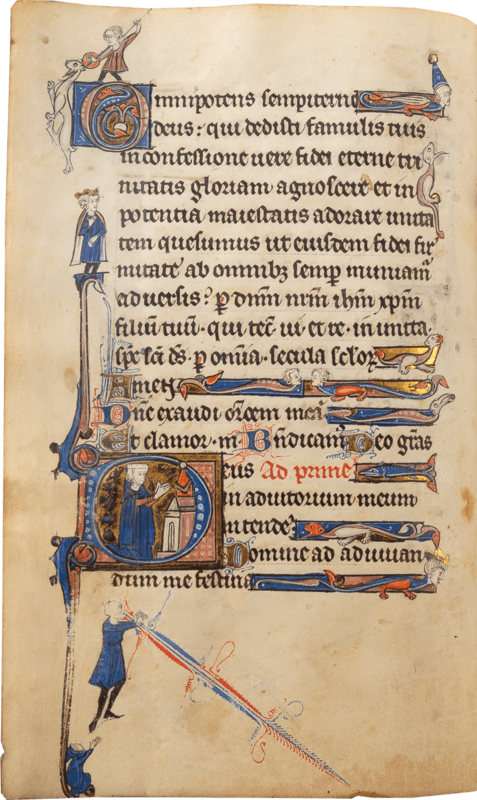 The first examples of Books of Hours in France began to appear as separate volumes made for lay use, often for noble women, around the second quarter of the thirteenth century. 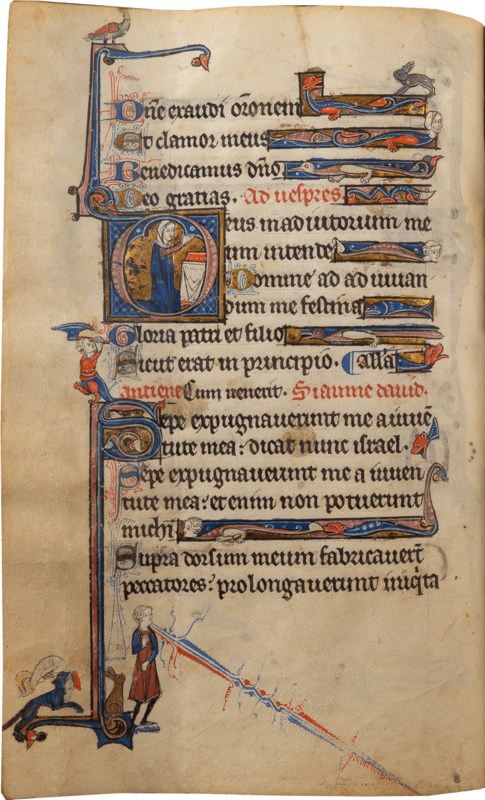 There is so far no published list, but probably about sixty French Books of Hours survive from before 1300, mostly from the last decades of the century. There may be no more than a dozen or so from as early as the third quarter. Compare that with perhaps upwards of 10,000 extant Books of Hours from the late Middle Ages, and many more among the earliest printed books. In private hands, the Hours of Marie can probably only be matched in date by a much smaller Book of Hours apparently of the Use of Troyes with 9 historiated initials (only) which was described in Les Enluminures, An Intimate Art, 2012, no. 1. For 15 years the Hours of Marie shared a home in the Cloisters, and often a glass case, with the Belles Heures of the Duc de Berry. 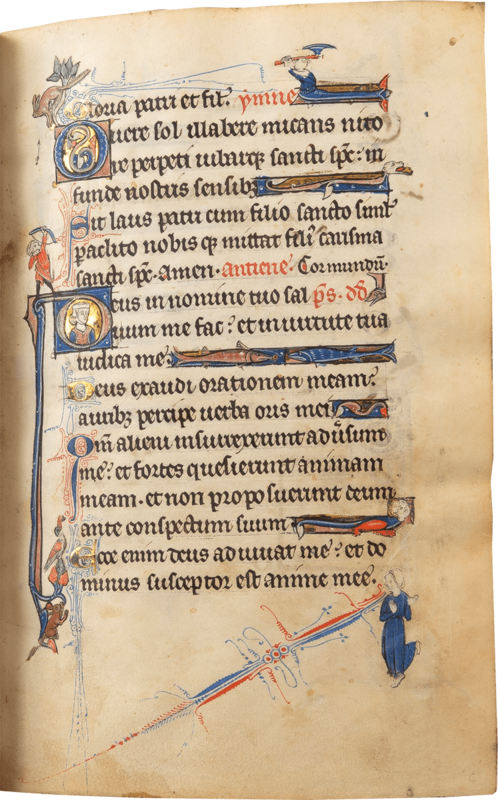 There are two rare and extraordinary themes in the text and decoration of the Hours of Marie. The first theme is that it is unambiguously made for female use. The origins of the literacy of women are notoriously poorly documented. "This prayerbook offers a rich yield of textual and pictorial information on the devotional practices of a woman and her family early in the reign of Philip IV" (Bennett 1996, p. 21). 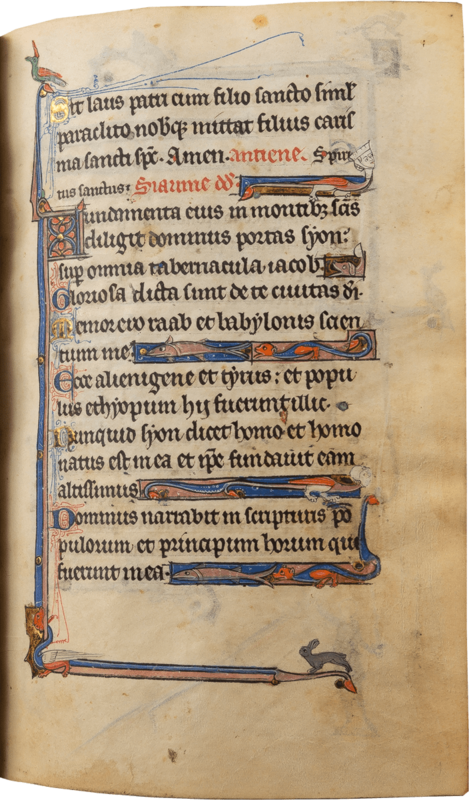 Many prayers are in specifically female forms (folios 176r, 200r, 205v, etc.). There are three prayers to Saint Nicholas, patron saint of young women. Bennett interprets the multiplicity of rabbits as a symbol of wishful fecundity. Very many rubrics are in French, and it is assumed that women, unlike men, were taught to read in the vernacular, itself an important stage in the development of modern languages. 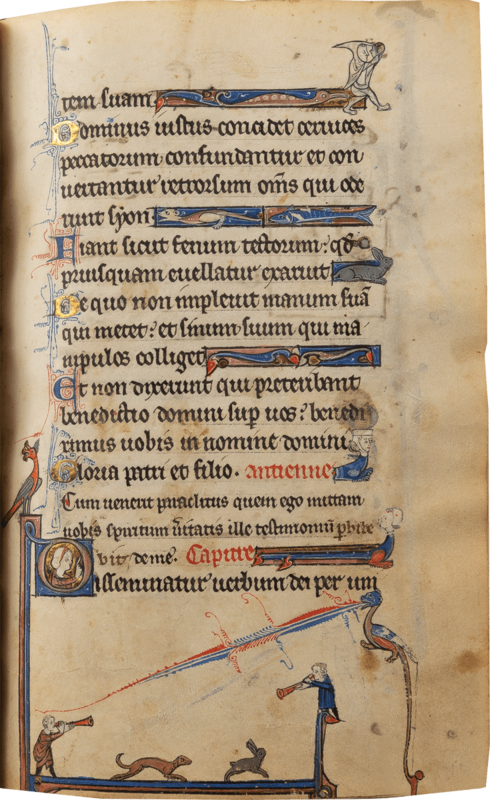 The manuscript may well have been an introduction for teaching Latin to a young woman. The illustrations are filled with female imagery. 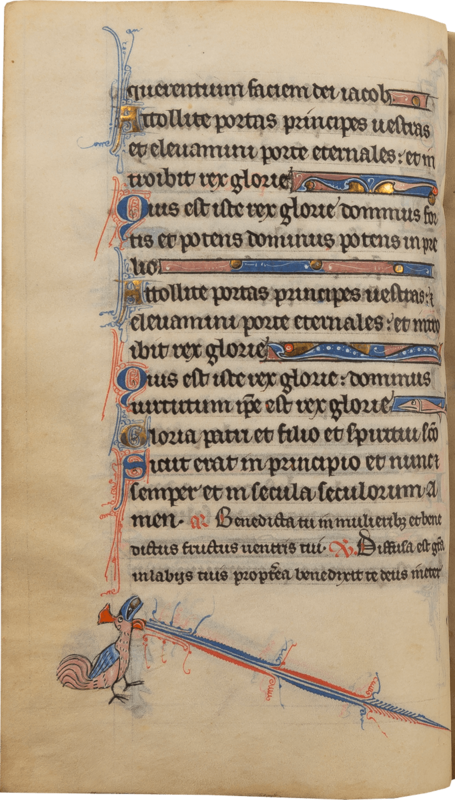 Fifteen of the historiated initials include or show contemporary women in daily life, either in prayer or "actively involved with religious life and family life from childhood to death" (Bennett 1996). These include the upbringing of children and the teaching of reading. There is emphasis on female saints, especially Mary Magdalen, Marie's name saint. 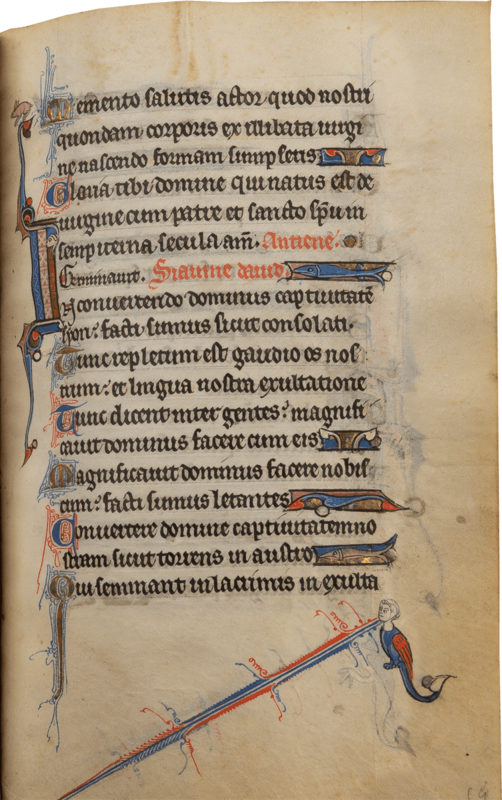 It is assumed but very difficult to document that Books of Hours were in their origins primarily intended for women (while men used Psalters) but in no other early example is this patronage so clearly emphasized. The hundreds of border figures show a high proportion of woman involved in daily activities, including male occupations like falconry, and they conjure up an outside world very visible from a woman's perspective. 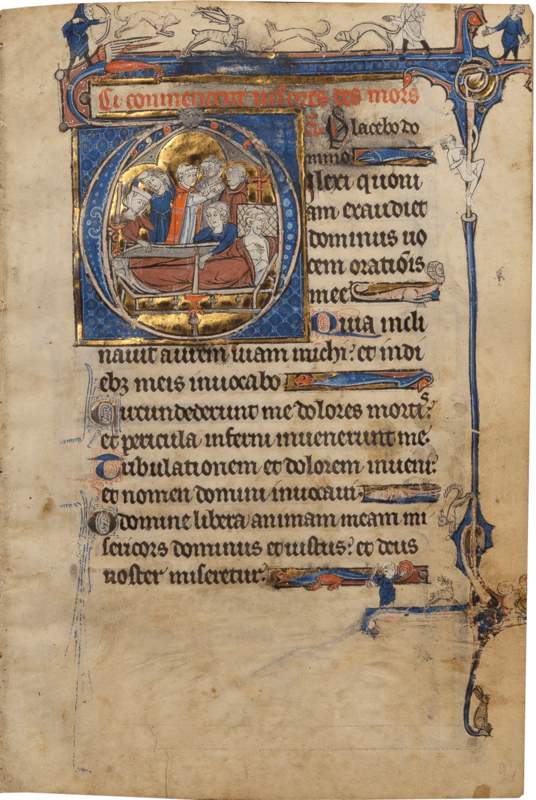 The choice of text and imagery is so personalized and so unlike any other thirteenth-century Book of Hours that it is almost inconceivable that Marie herself was not involved in their selection. 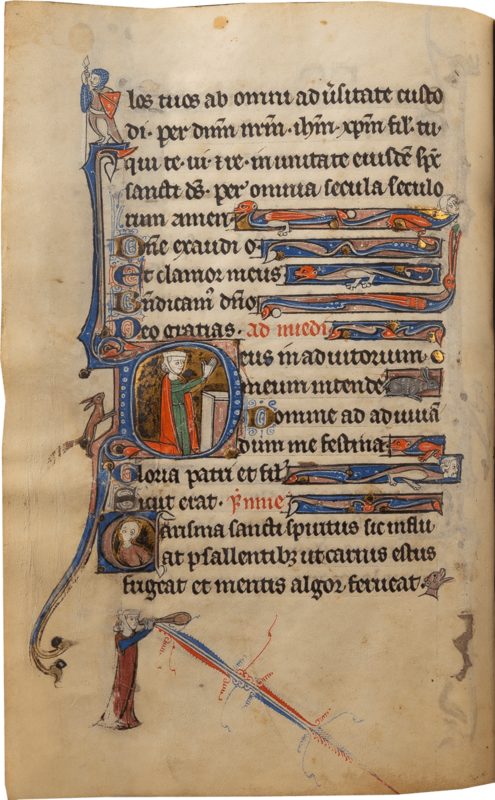 For the history of female literacy, spirituality and patronage of the arts in the Middle Ages, the Hours of Marie is "outstanding" (Bennett 1996). The second theme of the manuscript is the setting of the royal court. Whether or not Marie is to be identified with Marie of Brabant or with another woman of her circle or household, displayed prominently here are the intimate preoccupations of the period. 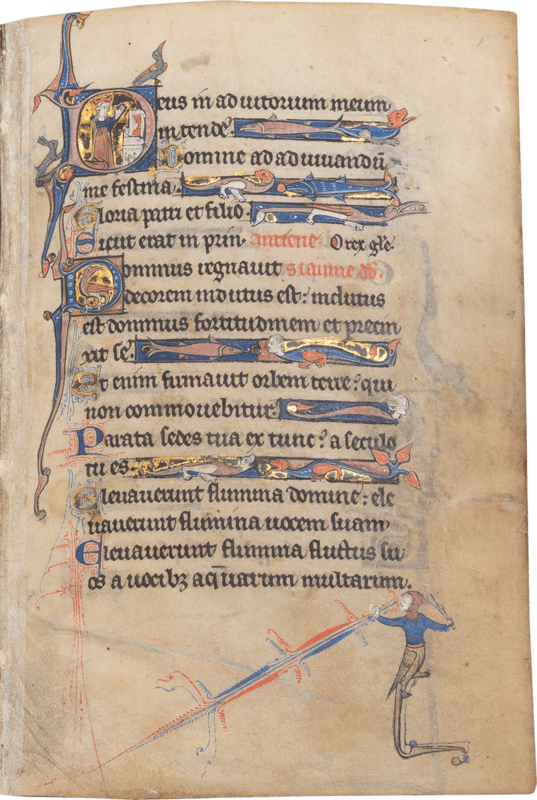 There is a prayer on folio 87r about the Crusades, beseeching God who chose the Holy Land for our redemption to free it now from the pagans. In 1270 the future Philip III had accompanied his father Saint Louis on the Eighth Crusade. He was known as le Hardi from his knightly bravery in combat. The miniature along the upper margin of folio 66v shows what must be a battle in the Crusades, in which one army gallops haphazardly out of a city which seems to have a gold crescent around a spire to confront an orderly charge from a group of mounted knights encamped in a tent emblazoned with the royal fleurs-de-lys. Saint Louis died in north Africa on 25 August, whereupon Philip was proclaimed king of France; his first wife died soon after and Philip arrived back in France as a widower. The miniature on folio 96r shows a death bed, and there is a queen with downturned eyes in the adjacent margin. 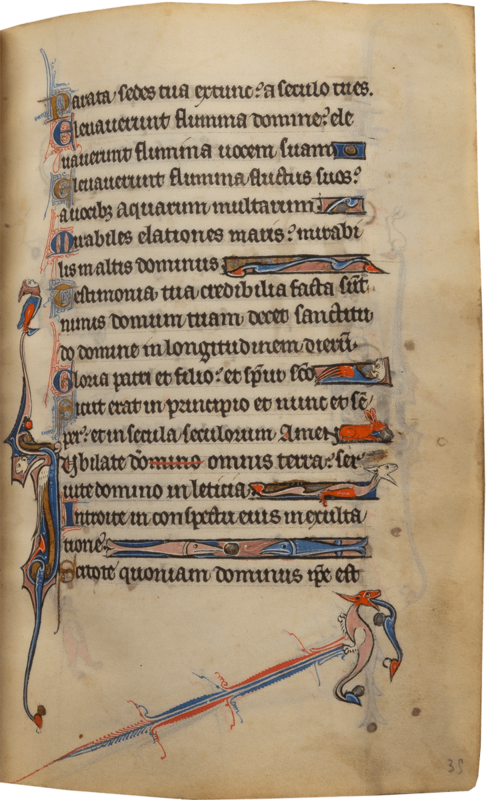 Undoubtedly the book was written for female use for a woman called Marie, who is named in a prayer to God at the top of folio 198v, "famula tua maria" - "your servant Marie"- probably the earliest extant Book of Hours made for any patron mentioned by name in the text. She is frequently shown in the miniatures kneeling in prayer, twice as a queen wearing a golden crown (folios 1r and 7r). 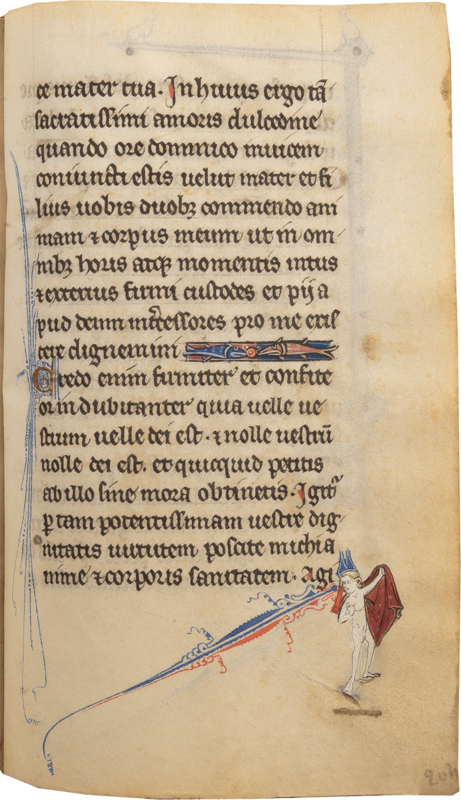 The kneeling figure on folio 13v is a king. Crowned queens occur commonly as marginal figures, including facing the death scene (folios 93v-94r) and on the last full page of text. 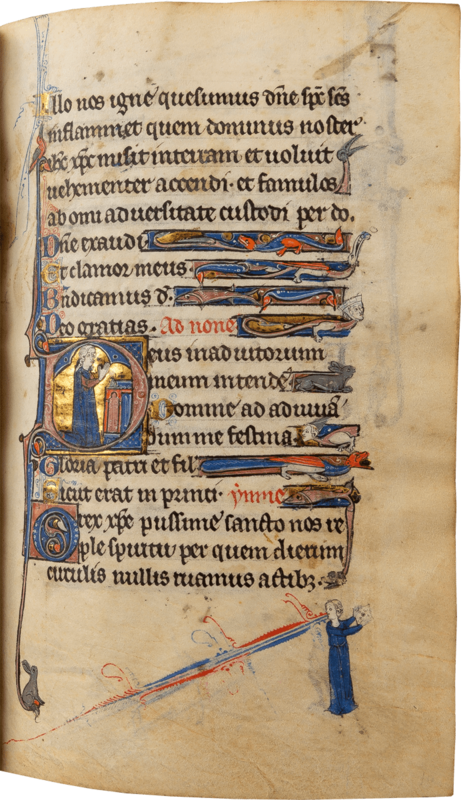 One vignette shows a king of France fighting in the Crusades (folio 66v) and the text includes a crusader prayer (folio 87r). The Use is that of Senlis, north east of Paris, and invocations of saints suggest connections both with the court of Paris and the southern Netherlands. The artist, however, probably worked in Reims, east of Senlis, metropolitan capital of the Church in France. The likelihood is that the manuscript was made for an intimate of the court of Philip III of France (r. 1270-85), a crusader, who was crowned in Reims Cathedral on 30 August 1271. 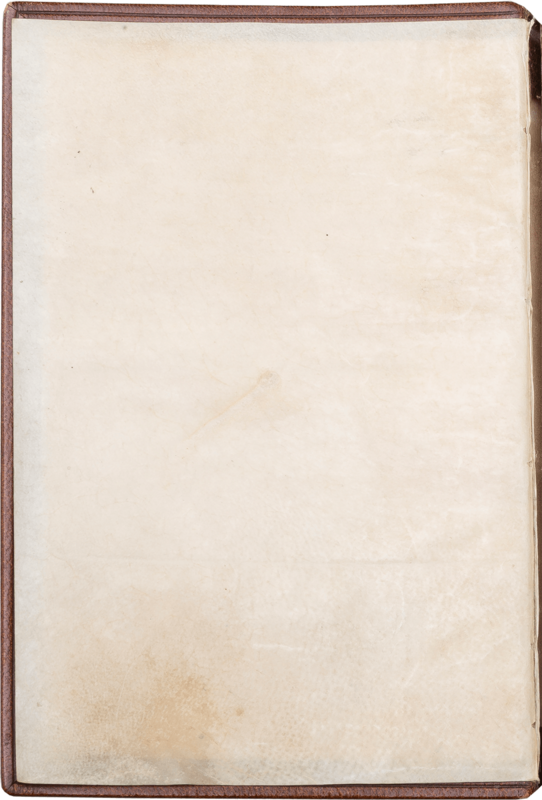 The first page, which is missing, would have contained any coats-of-arms. 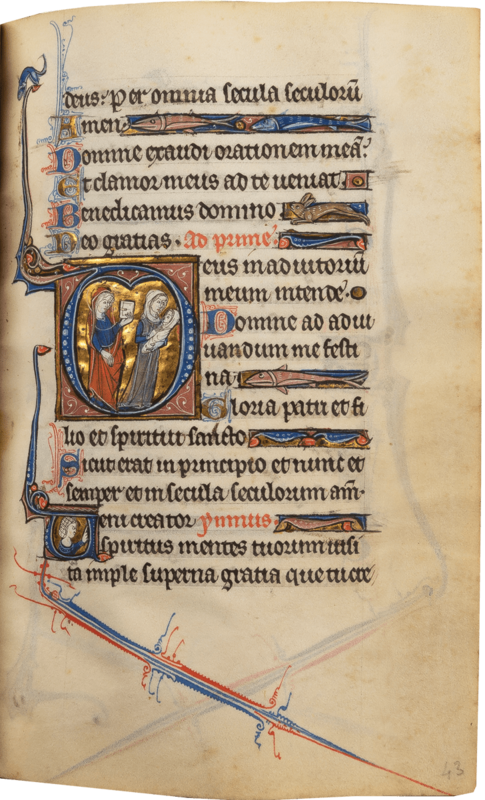 As already mentioned, a possibility has to be that this was the Book of Hours of Marie de Brabant (1256-1321), queen of France, who married Philip III at the age of 18 on 21 August 1274. The date would fit the artistic style, as would the liturgical blend and the emphasis on queens and the hoped-for fecundity of a young bride. Marie's eventual children were the count of Évreux and the future queens of Bohemia and England. 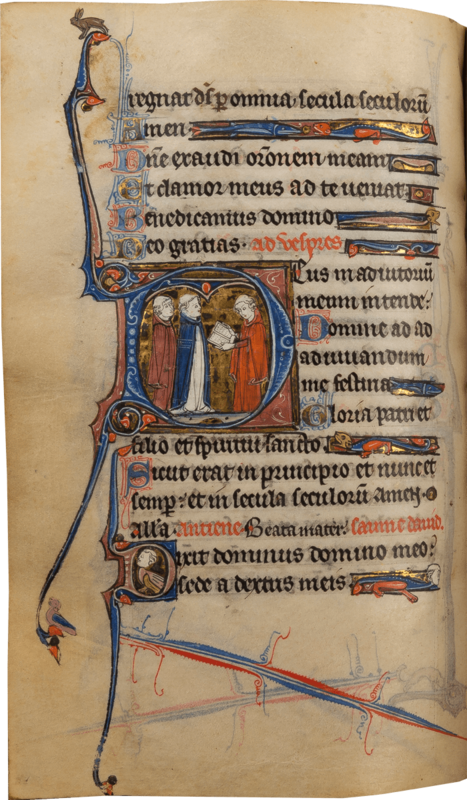 She was an ancestor of the Duc de Berry, Jeanne d' Évreux, Jeanne de Navarre, and other great patrons of the early royal Books of Hours of the fourteenth century. The manuscript is of astounding richness. Every page is glitteringly illuminated, generally with elaborate initials and line-fillers incorporating human and animal forms and displays of firework penwork. 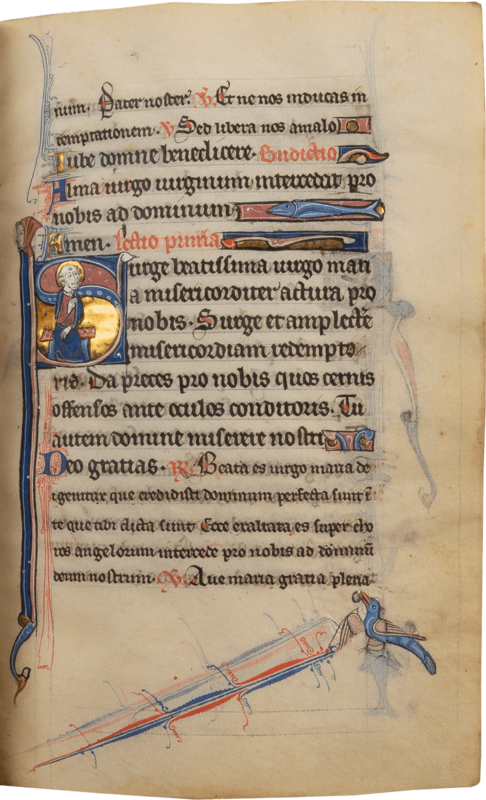 The principal artist of the miniatures, like the text, draws extensively from Parisian models in the style of the so-called "Bari" workshop in the 1250s and 1260s, named after a Gradual now in a church in Bari, probably made in the royal capella in Paris. The figure style includes the long-arched noses characteristic of that style, and colors resembling stained glass windows backlit by sunlight. However, the work here points to execution in northeastern France. 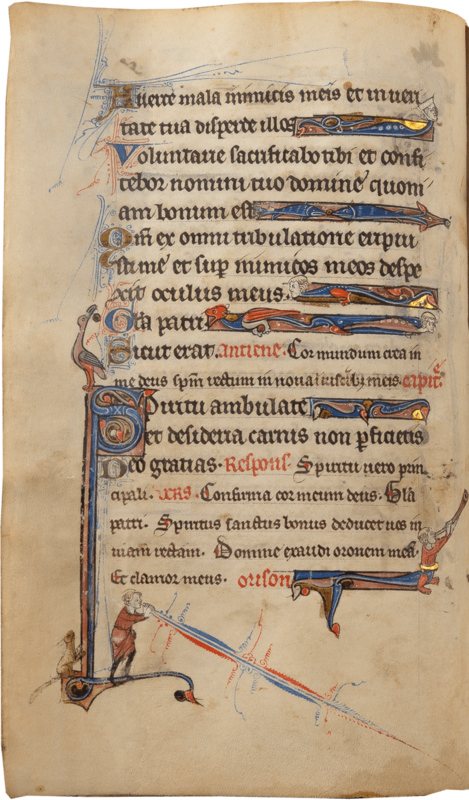 The choice of antiphons in the text is that identified later as being of the Use of Senlis, although it is not clear how precisely usage is localizable to place of production in the thirteenth century. 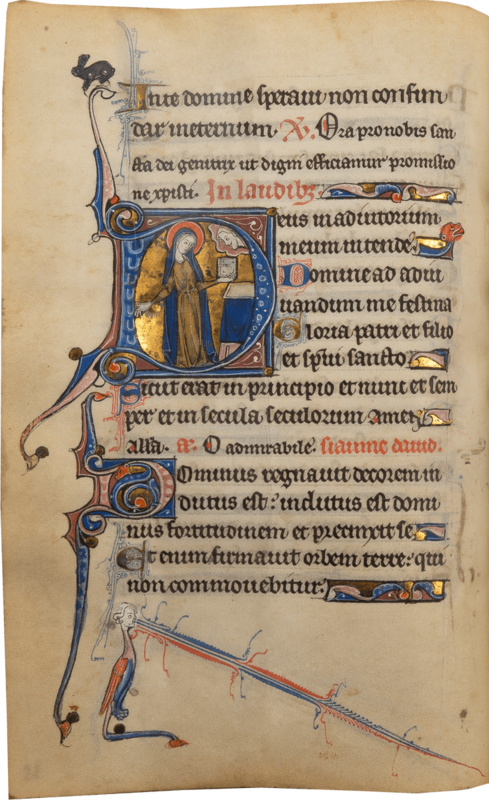 The closest consistent parallels are with illumination in Reims, seat of the metropolitan archdiocese, and Alison Stones describes the painter of the Hours of Marie as a "Reims Master." 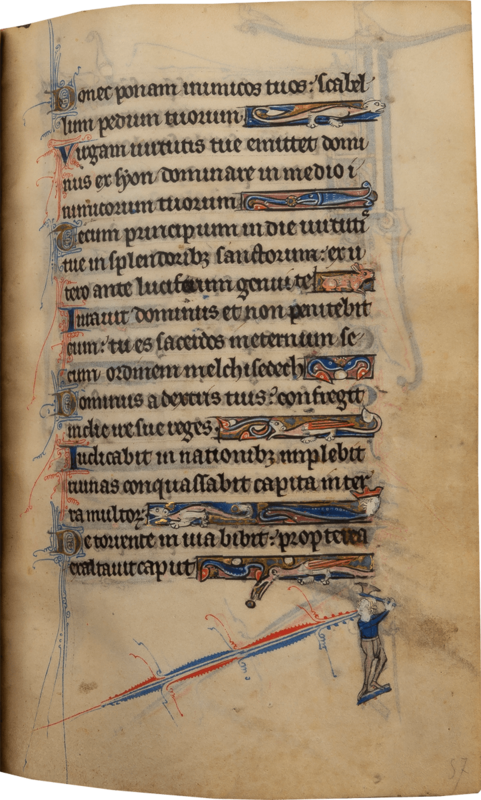 There is a close kinship with the presumed Reims Psalter in the British Library, Add. 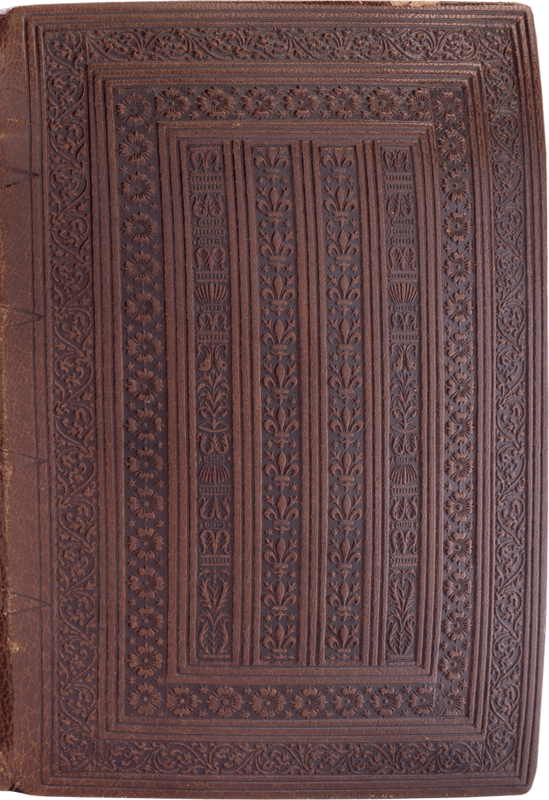 MS 17868, which also shows dependence on earlier Parisian designs. Reims Cathedral is one of the greatest of all thirteenth-century buildings and the city was a notable focus for artists. This was probably a workshop rather than the hand of a single illuminator. 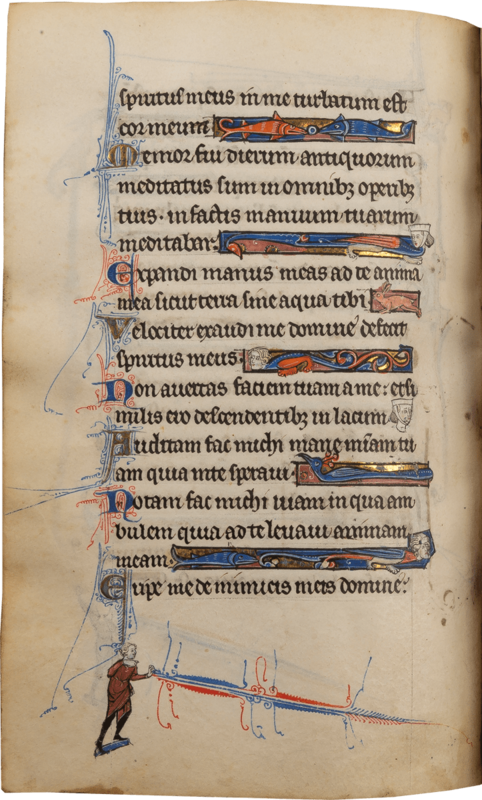 The use of gold in the initials on folios 34v and 53v is different, within a consistent style. 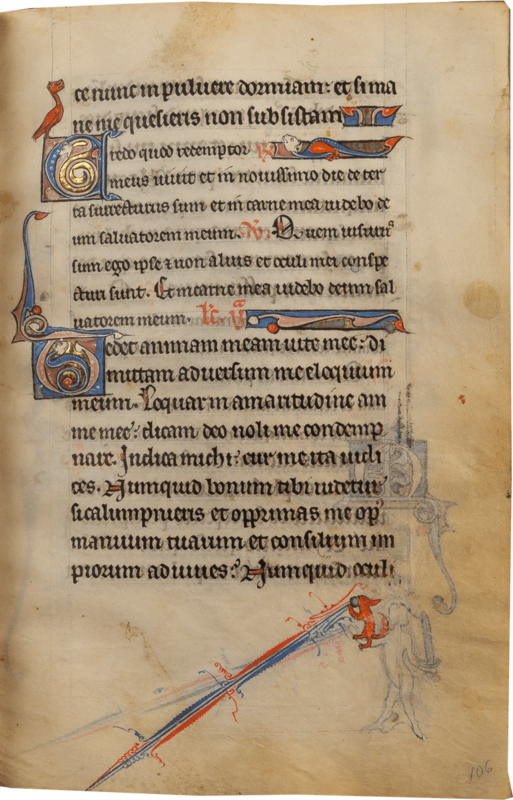 The oddity is in the two relatively minor initials on folios 146v-147r including little men in prayer and dragons with large wings of extraordinary splendor. 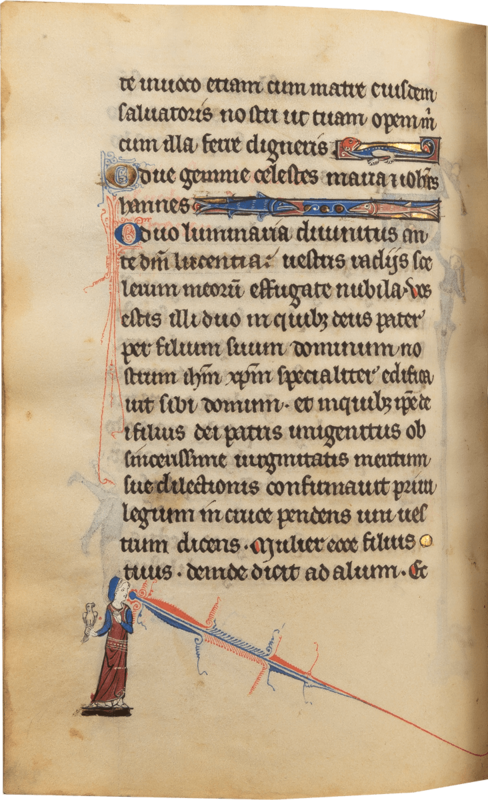 These are by an artist who worked in Cambrai, known as the Master of Johannes de Phylomena, from an Evangeliary in Cambrai, signed by a scribe of that name (Bibliothèque municipale, MSS 189-90). 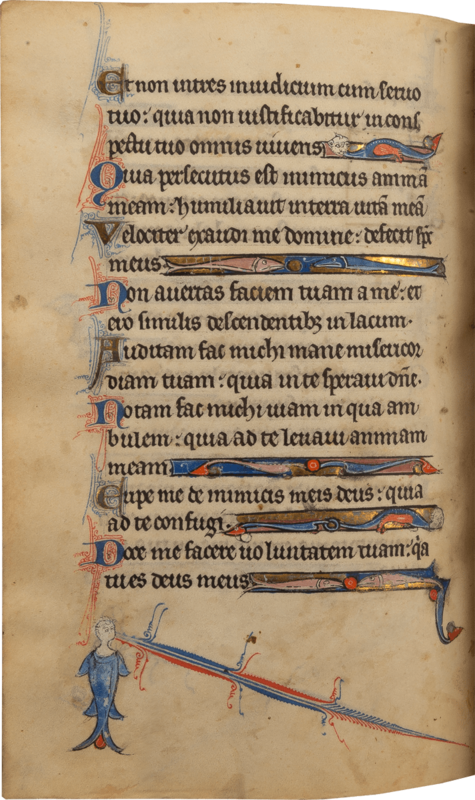 In addition to the larger initials, the manuscript has an almost unparalleled richness of minor decoration, filling and supplementing the text. 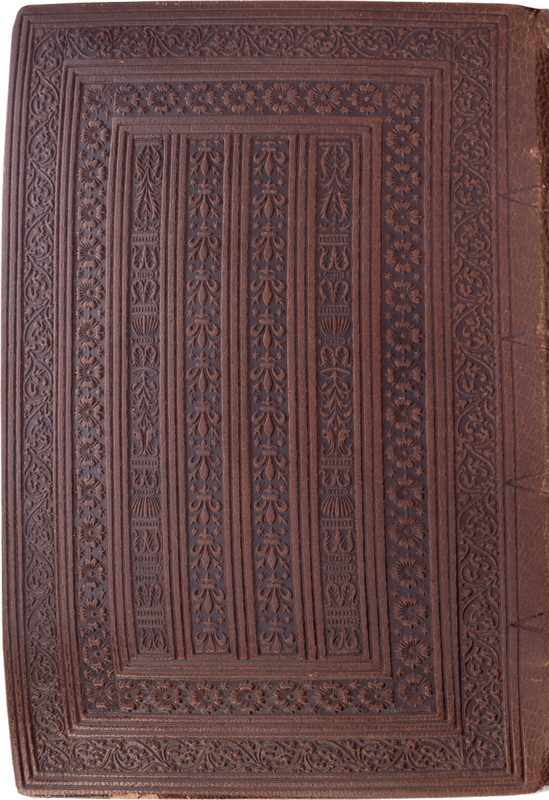 Adelaide Bennett writes: "Until now, no other contemporary French manuscript - Parisian or from the northeast - has prepared us for the virtual explosion of coordinated penwork and imagery in the margins of Marie's book" (Bennett 1996, p. 24). The sale catalogue of 1932 counted 280 illustrated scenes or figures in the borders. The margins are filled too with sparkling color: "astonishing penwork sprays resemble sparks, often converging toward the gutter of the book" (Bennett 1996, p. 24). 1. 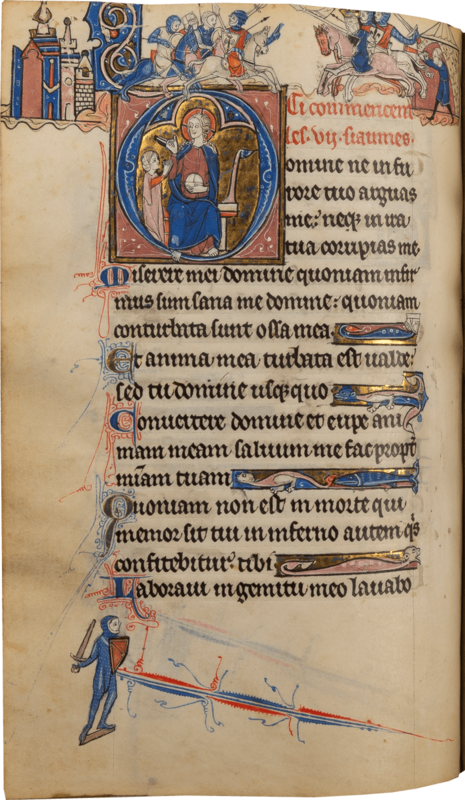 Folio 1r, A queen praying at an altar, historiated initial, 3 lines. 2. 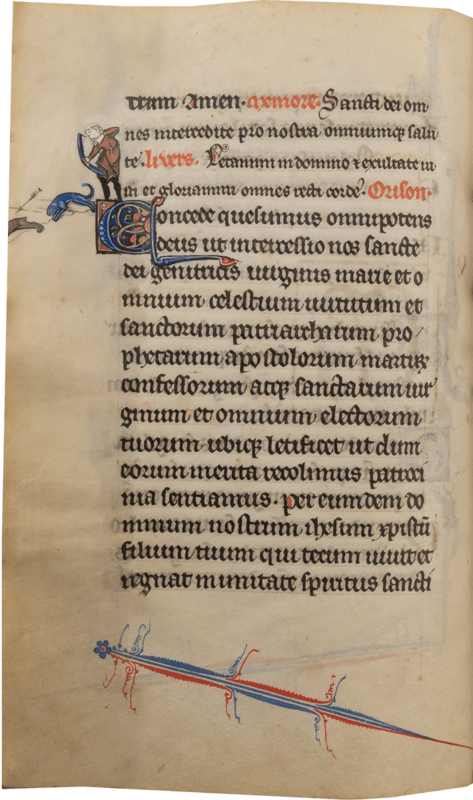 Folio 3v, A noblewoman in prayer before a church, 4 lines. 3. Folio 7r, A queen praying at an altar, 4 lines. 4. Folio 8v, A noblewoman praying before an altar, 4 lines. 5. 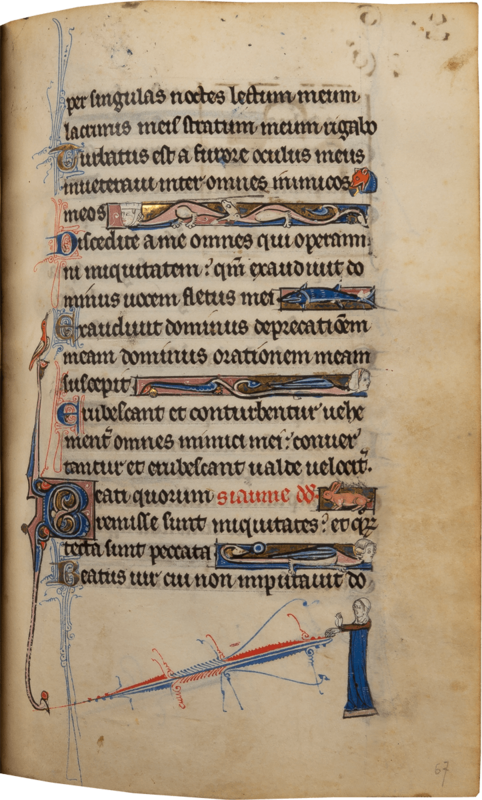 Folio 10r, A young woman in prayer before a church, 4 lines. 6. 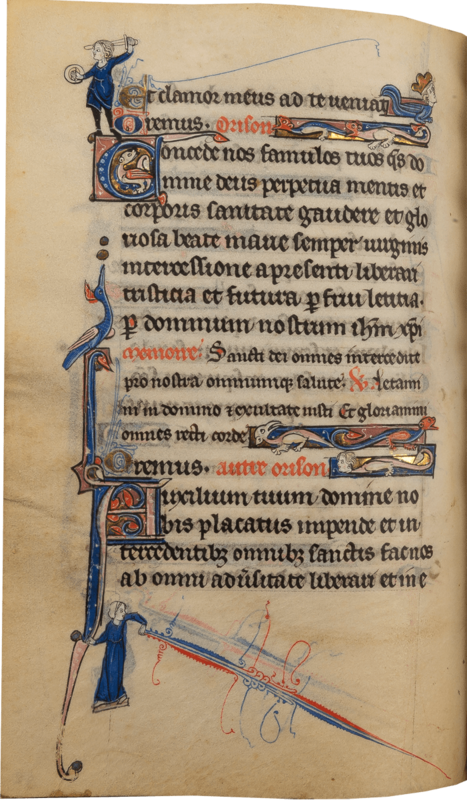 Folio 11v, A noblewoman praying before an altar, 4 lines. 7. 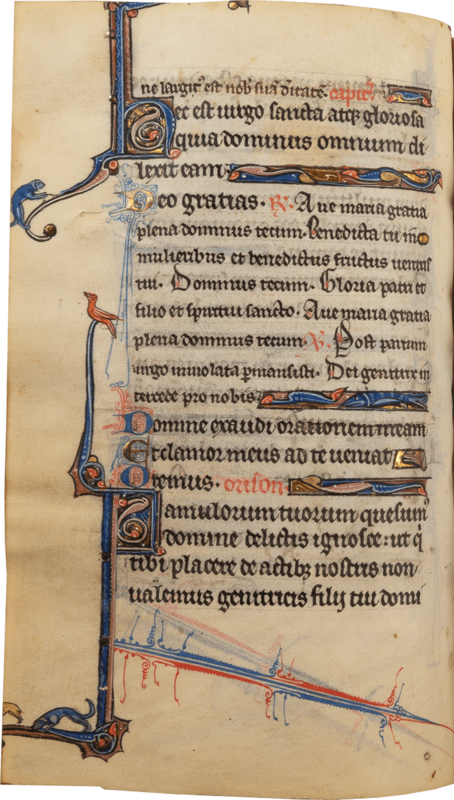 Folio 13v, A king in prayer before an altar, 4 lines. 8. Folio 17r, A noblewoman with her daughter kneeling before the Virgin and Child enthroned, 9 lines, within an elaborate border including a hunter with hounds chasing a hare, a piebald musician with a viol, a tournament with three galloping knights and two fighting solders judged by a woman with banners and watched by other women on the battlements of a castle. 9. Folio 22r, Saint Peter seated on a bench, 4 lines. 11. 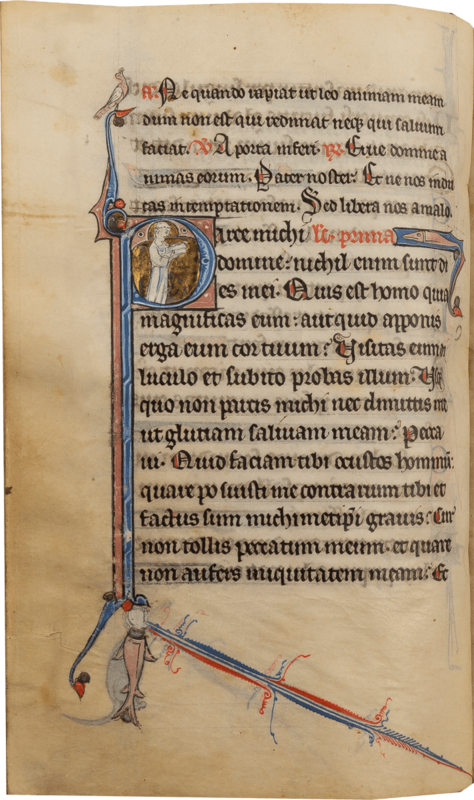 Folio 43r, A female saint holding out a closed book towards a young mother with a baby, 6 lines, "quite unusual … The mother in intimate contact with her infant demonstrates her very human concern for parenting - nurturing and caring for her child" (ibid., Bennett 1996). 12. Folio 47, A woman seated with a book addressing a young man standing beside her, 6 lines, "suggests a household scene of a mother educating her son" (ibid., Bennett 1996). 13. 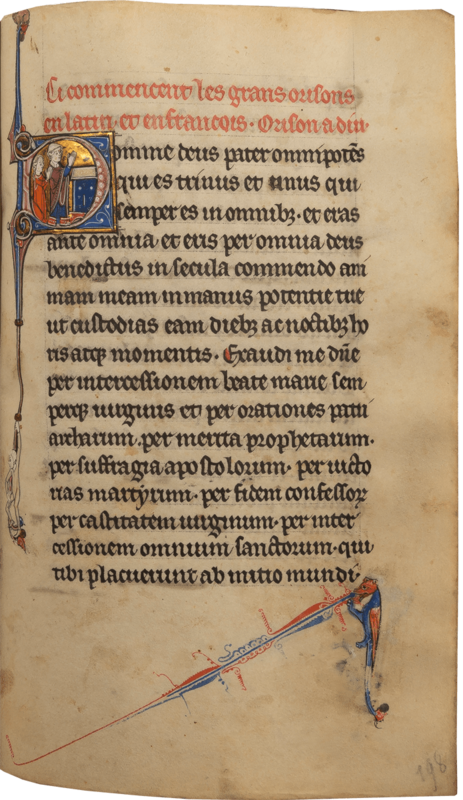 Folio 50v, A young woman kneeling in a church while a saint appears to her and admonishes her holding a scroll, 6 lines. The naked man in the margin "may be apotropaic, protecting against dangers of lust and sexuality" (Bennett 1996, p. 27). 14. Folio 53v, A young woman kneeling in prayer, with Christ appearing to her, 6 lines. 15. 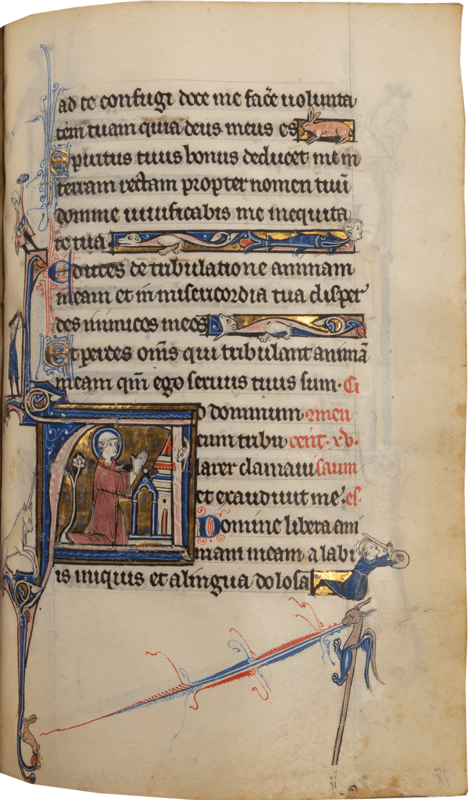 Folio 56v, A young man, perhaps at school or university, wearing a red robe and holding a book, being addresed by a priest and master in a brown habit, 6 lines. 16. 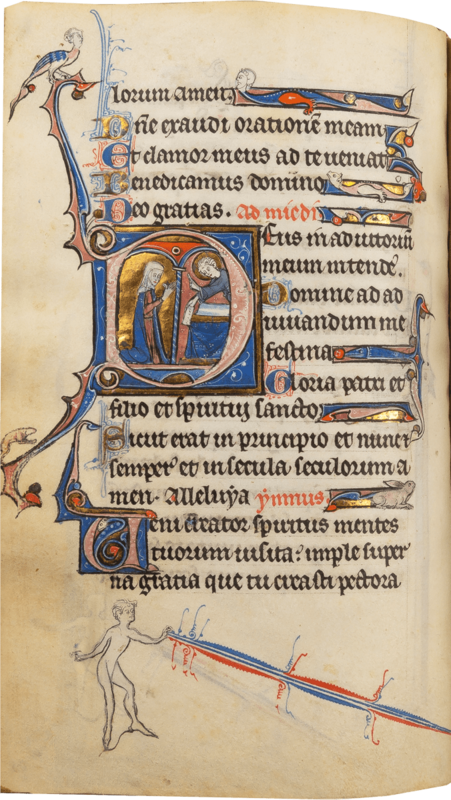 Folio 62r, A young woman kneeling behind a priest who reads from a book on a lectern, 6 lines, watched by an older woman, probably her mother, from the lower margin. 17. Folio 66v, A woman in prayer before Christ enthroned and blessing her, 6 lines, with vignette along the upper margin showing a battle in the Crusades, with Saracens galloping out from a city with a gold crescent on a tower to confront a Christian army led by a king and knights with a fleur-de-lys on a shield, as a trumpter stands outside their tent emblazoned with fleurs-de-lys. 18. Folio 75r, Saint Francis kneeling in prayer before a church or hermitage, 6 lines, with a unicorn in the margin beside him. 19. Folio 94r, A death scene, a man lying in bed attended by his wife and (probably) son, with another woman tearing at her hair and two priests and a figure behind who seems to be wearing a crown, 8 lines, upper margin including a hunting scene with an archer shooting a stag cornered by hounds. 20. Folio 105v, A priest reading a lection in the Office of the Dead, 3 lines. 21. Folio 186r, A woman kneeling in prayer before an altar, with Christ appearing to her, 4 lines. 22. 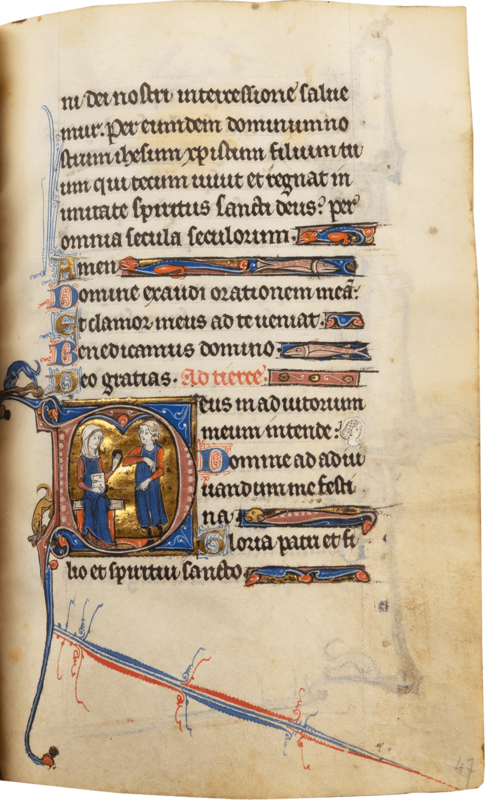 Folio 198r, A young woman kneeling with her priest at an altar, 3 lines. 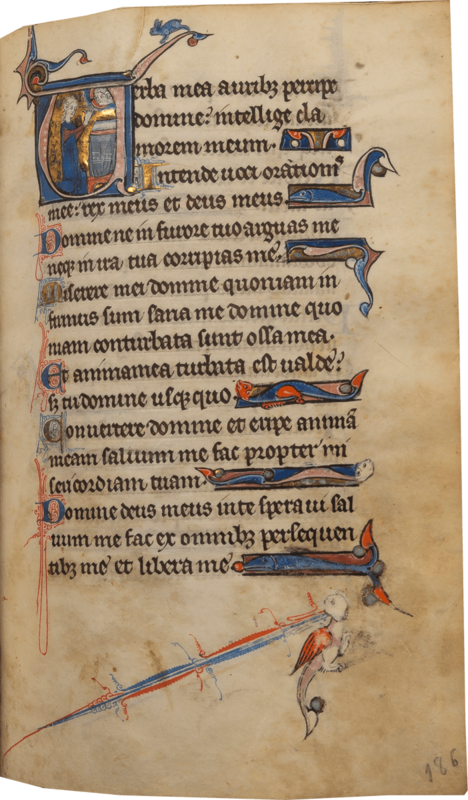 There are 2-line historiated initials showing heads of women (including folios 11r, 12r, 12v, 14r, 25r, 31r, 35v, 43r, 50r, 82v, 93r, 95v, 99v, 131r, 155v, 159v, 160r, 164r and 182v) and occasionally showing men (such as 44r, 49v - a knight - 104r, 158v and 162r). The marginal figures and grotesques include queens, one reaching up to a bird (folios 2v, 58r, 77v, 93v and others), a king (3v), an ape in a king's crown (63r), a seated woman spinning with a distaff (59r), knights in armor (8v and 91r), monks (11r, 45r and 78v), a priest (65v), children (59v, 60r, 79v and others), peasants in hoods (1r, 6v, 64r and others), man in a blue tunic (2r, 3v - with a praying monk - 19r), men with swords (1v, 9v, 37r, 58r - with a scimitar and perhaps therefore a Saracen - 99r, and others), a man with a club (10v, and many others), in one (76r) the club may be a bat and the accompanying dog appears to be guarding balls; a man with a bat hitting something into the air (167r), a boy in blue trousers with a dog (12v), bell-ringers (65r, 73v, 79r and 193r), a viol player (76v), travelers with staffs and shoulder bags (57v and 72r), men with axes (11v, 14v, 57r, 68r, 148r, 200v and others), men with club and drums (2v and 37v), a man with a hammer and a shield (64v), a naked boy with a flail (79v), a man with a hare (11v), archers shooting birds (10v, 13v and 151r), an archer shooting a hare chased by a hound (42v) and shooting a hare (119r, 156v and 201v), an archer shooting what looks like a pie vendor (75r), a man clasping his brow as he stares at a bird (7r), a hunter aiming his sling at a hare (205v), two men blowing trumpets as a hound chases a hare (12r), a man with a club and shield watching a hound and a hare (14r), a bishop blessing (3r and 63v), a jester offering some trick to a grotesque in a cardinal's hat (62v), a bell-ringer standing on his head with a hare on his bottom (203r), naked men (29r, 40v, 50r, 50v, 53r, 55v - protecting his modesty with a gold ball - 86r, 106v, 190r, and others), a naked man with a scimitar and a severed head (185r), grotesques with haloes, crowns, dressed as jesters, battling, and numerous other activities, countless hounds and hares, birds, dragons and other creatures, a blue dog standing upright on a trapeze (67v), a dancing goat (70v), a cat with a man's head (105r and 109r), many women, standing, waving, grasping the penwork, a woman drinking from a bottle (8v), a woman holding out a ring to a knight (66v-67r), a bare-footed girl dancing (5r), a dancing girl with castanets (8r) and other musical instruments (10r and 77r), dancing (61r), a woman in prayer (60v), a girl with a hare (13r), a woman with a falcon (203v), a woman looking into a mirror (204v), mermaids (22v, 27r, 32v, 35v, 36v, 39v, 79v, 86v, 87r, 91v, 92r, and many others), foxes running off with chickens in their mouths (11v and 14v), a grotesque knight fighting a snail (114r), a bird with a gold ring in its beak (22r), a man spearing a lion (3v), a man with an axe chasing a long-tailed hare into a bush while an archer shoots it with an arrow (6r), a man grasping the penwork, watched by a long-tailed hare (6v), hound chasing a hare (1v and very many others), chickens (20v and 21v), peacocks (87v and 124r), a red squirrel (106r), a large pink hound (23v), and many, many others. 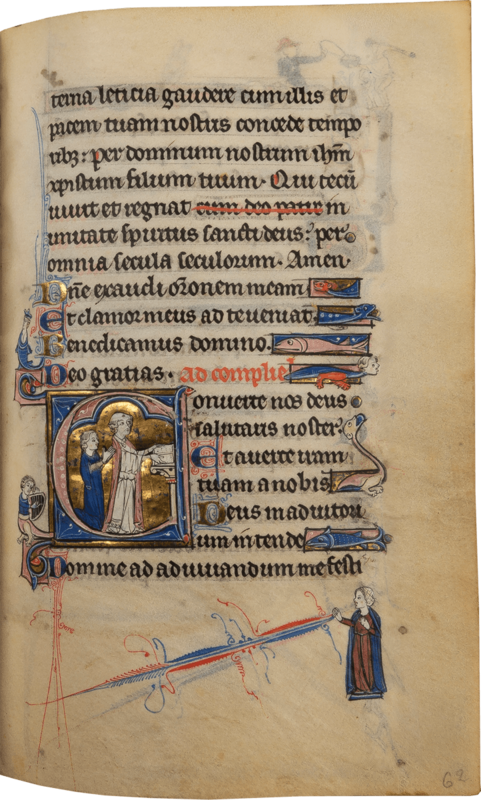 A. Bennett, "A Thirteenth-Century Book of Hours for Marie," The Journal of the Walters Art Gallery 54, Essays in Honor of Lilian M. C. Randall (1996): 21-50. B. D. Boehm, "Recent Acquisitions, A Selection: 1996-1997, Medieval Europe," The Metropolitan Museum of Art Bulletin 55, no. 2 (Fall 1997): 21. J. Higgitt, The Murthly Hours: Devotion, Literacy and Luxury in Paris, England and the Gaelic West, London and Toronto, 2000, p. 182. K. A. Smith, Art, Identity and Devotion in Fourteenth-Century England, Three Women and their Books of Hours, London and Toronto, 2003, p. 146, n. 99. A. Stones, "Some Portraits of Women in their Books, Late Thirteenth - Early Fourteenth Century" in A.-M. Legaré, ed., Livres et Lectures de Femmes en Europe entre Moyen Âge et Renaissance, Turnhout, 2007, pp. 3-27, at p. 16. V. Reinburg, "'For the Use of Women': Women and Books of Hours," Early Modern Women, An Interdisciplinary Journal 4 (2009): 235-40, at p. 235. 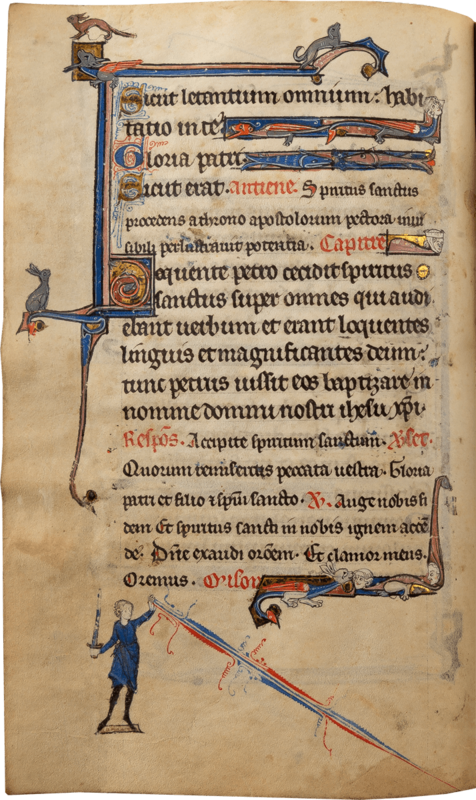 R. A. Leson, "Heraldry and Identity in the Psalter-Hours of Jeanne of Flanders (Manchester, John Rylands Library, Ms. lat. 117)," Studies in Iconography 32 (2011): 155-98, at p. 192, n. 52. 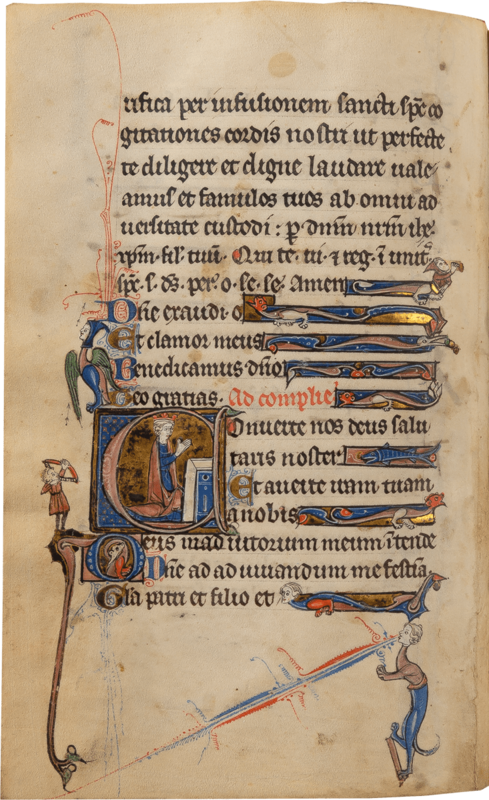 A. Bennett, "Making Literate Lay Women Visible: Text and Image in French and Flemish Books of Hours, 1220-1320," in E. Gertsman and J. Stevenson, eds., Thresholds of Medieval Visual Culture: Liminal Spaces, Woodbridge, 2012, pp. 125-58, at pp. xiii, 129, 137 and pls. on pp. 138-42. S. Hindman and A. Bergeron-Foote, An Intimate Art, New York, Chicago and Paris, 2012, p. 19 and pl. on p. 32. A. Bennett, "Some Perspectives on Two French Horae in the Thirteenth Century," in S. Hindman and J. H. Marrow, eds., Books of Hours Reconsidered, Turnhout, 2013, pp. 19-40, at p. 25. A. Stones, Gothic Manuscripts, 1260-1320, A Survey of Manuscripts Illuminated in France I, 1, London and Turnhout, 2013-2014, pp. 62, 66 and 118; I, 2, pp. 405 and 494; and II, 2, p. 203 and ills. 345 and 412. A. Sand, Vision, Devotion, and Self-Representation in Late Medieval Art, Cambridge, 2014, p. 339, n. 52. M. Doyle, "The Portrait Potential: Gender, Identity and Devotion in Manuscript Owner Portraits, 1230-1320," PhD diss., Bryn Mawr College, 2015, pp. 78 and 175. 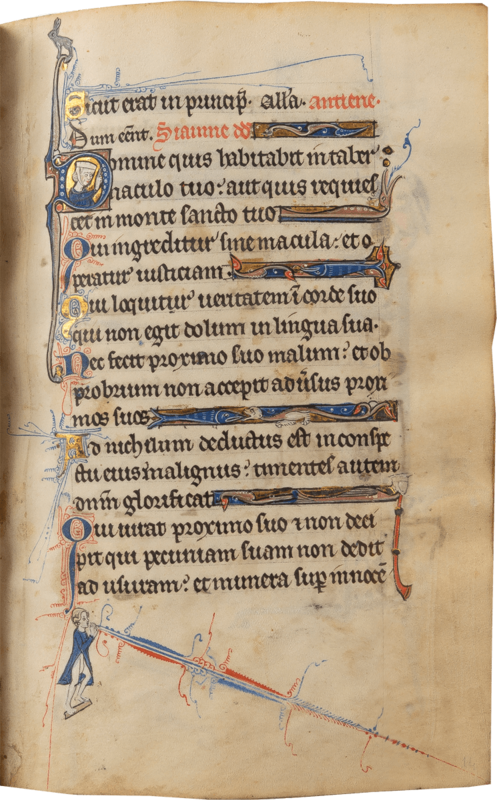 R. R. Horden Collerson, "The Penitential Psalms as a Focus Point for Lay Piety in Late Medieval England," PhD diss., University of Sydney, 2018, pp. 28-29. Alexandre-Bidon, D. "Prier au féminin? Les livres d'heures des femmes," in A. Cabantous, ed., Homo Religiosus: Autour de Jean Delumeau, Paris, 1997, pp. 527-34. Buettner, B. "Women and the Circulation of Books," Journal of the Early Book Society 4 (2001): 9-31. Clanchy, M. "Did Mothers Teach their Children to Read?," in C. Leyser and L. Smith, eds., Motherhood, Religion and Society in Medieval Europe, 400-1400, Essays presented to Henrietta Leyser, Farnham, 2011, pp. 129-53. Donovan, C. The de Brailes Hours, Shaping the Book of Hours in Thirteenth-Century Oxford, London, 1991. Groag Bell, S. "Medieval Women Book Owners: Arbiters of Lay Piety and Ambassadors of Culture," in M. C. Erler and M. Kowaleski, eds., Women and Power in the Middle Ages, Athens (Georgia), 1988, pp. 149-87. Legaré, A.-M. "Livres d'heures, livres de femmes," Eulalie 1 (1998): 53-68. Penketh, S. "Women and Books of Hours," in L. Smith and J. H. M. Taylor, eds., Women and the Book, London, 1996, pp. 266-81.